Rachel Bleiweiss-Sande’s current work uses the traditional, wheel-thrown form to express creativity, emotion, and organic beauty. 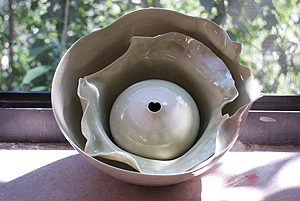 Her pieces are each thrown by hand, using porcelain or stoneware clay bodies. 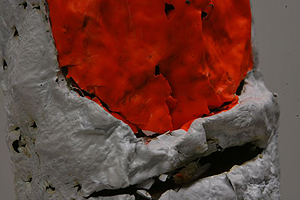 The artist attempts to engage in a sort of dialogue with the clay as she works, allowing natural imperfections to appear and persist as she stretches the clay to its limits. Each piece represents a unique process, readily visible in the particular kinks, folds, and dents of the vessel. Rachel was introduced to the potter’s wheel at the age of eight in her hometown of Berkeley, California. She has spent years learning the technique and craft of throwing, and has experimented with pit-firing, Raku, and a variety of glazes. After graduating from high school, Rachel relocated to the east coast to attend Princeton University, where she earned a degree in architecture. She is currently working for painter Mary Heilmann. 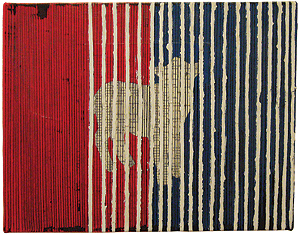 Bonnie Kane’s Digital Tapestries reflect a combination of modern and traditional concerns, fine art and craft. Inspired by the tradition of Oriental silk scrolls, the tapestries came about as a solution to doing easily portable and storable large scale computer art (a result of the tremendous mobility and lack of storage space in NYC life). Lush and detailed images are created using the computer as paint and canvas. Then, each painting is dyed into the fabric from the digital files. The fabrics are colorfast, retain their natural texture, and are handcrafted into the finished tapestry. Each piece is one-of-a-kind. Born in Texas in 1978, James Case Leal lives and works in Brooklyn, NY. His actions and performances create relics, documents, and monuments that act as evidence of an imagined universe. Straddling both this world and an alternative now, his anti-narrative serves as a new model for the communal future. Case Leal is currently building an expansive series of sculptural television stations that broadcast images of this new universe. He has most recently exhibited at Unconvention in Minneapolis/ St. Paul, Road Agent in Dallas, TX, Buia Gallery in New York City, and Bendixen in Copenhagen, Denmark. 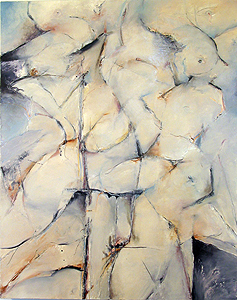 Ann Chisholm’s paintings explore the interaction of the subconscious mind and the conscious state. The artist’s work confronts countervailing concepts; it deals with a thesis, an antithesis, and a synthesis. 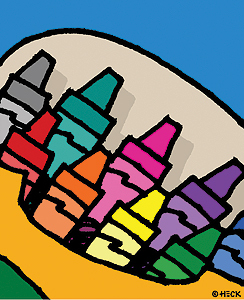 For example, with paint, color, and line each representing conflicting ideas. Fate contrasts with free will. Destiny is juxtaposed to chance. And science confronts religion. Random images are intermixed with designed and planned elements creating compositions with a harmonious disjointedness in which subject and meaning are partially concealed. Kevin Cyr has been living and working in Brooklyn for the past three years, and has also been doing short residencies in Beijing for the last two. He was raised in Northern Maine and attended college in Boston at Massachusetts College of Art. 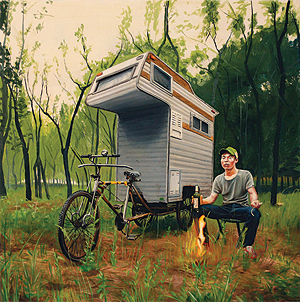 He is currently working on a project incorporating his Maine upbringing, and recent experiences from China, infusing elements of outdoor recreation with traditional Chinese modes of transportation. 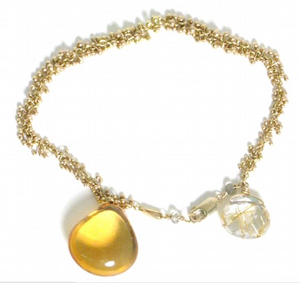 Dori designs and creates jewelry. “…my work is organic, instinctive and intuitive... I don’t work from theory… ..the best things happen when I step aside … allowing moments of creation to evolve the work organically ….this experience reflects my own evolving, experiental life……so when I am working well, my paintings become my life and in this process I’m honest to myself, I’m exposing myself, and I’m opening myself up to my own personal truths… …for me, experience is a “living breathing reality." Fresh. Bold. Engaging. These words often come to mind upon viewing the artwork of Pop Artist Ed Heck. One is immediately disarmed by the naïve charm of these brightly colored works on paper and canvas. 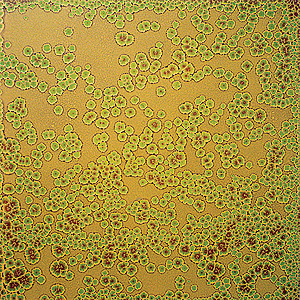 Ed Heck’s enigmatic canvases were first exhibited in New York City in 1999 and were an instant hit. The viewer response was overwhelming. Reactions ranged from surprised appreciation to pure delight. 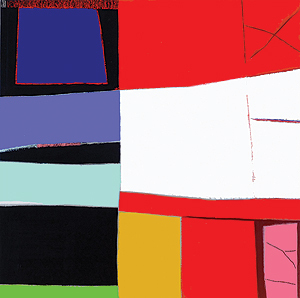 Ed Heck’s artwork appeals to a varied audience, from fine art newcomers to serious collectors. His eclectic style combines animation like subject matter with an evocative use of color, coupling a wry sense of humor with generous doses of irony. His images lead us into a place uniquely Heck, filled with weird and wonderful characters, odd landscapes and a quirky visual point of view, quite unlike anything else we’ve seen before. Welcome to the world of Ed Heck! 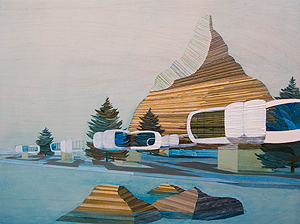 A graduate of the Yale School of Art, Paula Heisen has exhibited her work throughout the United States, with solo exhibitions in New York City and Houston. Among the grants and awards she received are an Elizabeth Foundation Grant, a New York Foundation for the Arts grant and an Ingram Merrill Foundation Grant, scholarships to Yale, the Skowhegan School and the New York Studio School. She has taught at Oxbow Summer Program, Yale University’s Summer Program and at the University of California at Santa Barbara, and has been a visiting artist at the Art Insitute of Chicago, Cooper Union and Hampton University. She lives and works in New York City. 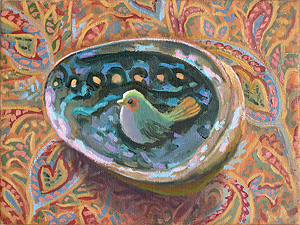 She is a perceptual painter, and works from still life set-ups that have combinations of unusual objects. Her goal is to create images that are both sensual and psychologically provocative. Brian Hubble’s paintings and video either blur the line between reality and imagination by way of humor and trickery, or blatantly goad the viewer at first sight. He is most interested in developing a unique brand of humor through the means of painting, drawing, and video situation. Whether it is revamping an old friend’s campaign to run his bike for president, developing the personality and artwork of an online alter ego, or failing to sell work to a group of mechanics to whom he once delivered auto parts, many of his pieces deceive or play jokes, usually at the viewer’s expense. Dina Ivanova & Jeff Pollastro have over 18 years experience between the two of them in traditional decorative painting. 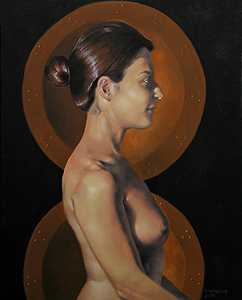 Dina worked with French Masters, Sylvie Michel, and Pierre Finkelstein. Jeff spent 8 years with Mr. Finkelstein, and have both worked with elite designers and architects worldwide. 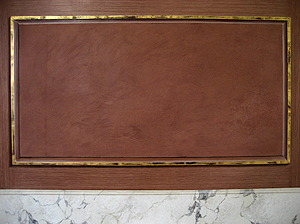 Decorative Painting Industries, Inc. roots itself in 18th and 19th Century European decor, but often accommodates modern and contemporary settings as well. DPI prides itself in its strong network of like-minded craftspeople from Los Angeles to New York to Europe and will combine efforts in order to generate the highest quality furnishing for every client. 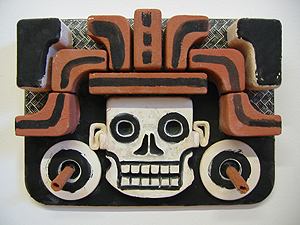 Steve Keister has exhibited his work in prominent galleries and museums since the late 1970’s. Solo exhibitions include the Museum of Contemporary Art in Chicago, The Larry Gagosian Gallery in Los Angeles, Galerie Rudolf Zwirner in Cologne, the BlumHelman Gallery in New York, and most recently Feature Inc., New York. Group Exhibitions include the 1981 Whitney Biennial, and “syrofoam” at the RISD Museum, and “Angles in America” this year. 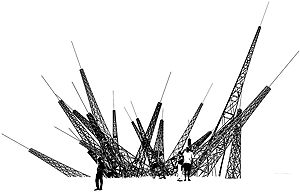 He has received numerous grants including the Guggenheim Foundation Fellowship in 2000. Mr. Keister’s work is included in many Museum collections including The Whitney Museum of American Art, New York, The Museum of Contemporary Art in Chicago, and The Museum of Contemporary Art, Los Angeles. He currently teaches at Princeton University and The School of Visual Arts. David Livingston was born in New York City on October 10th, 1982. He grew up in the city, and graduated from Kenyon College with an undergraduate degree in Studio Arts. 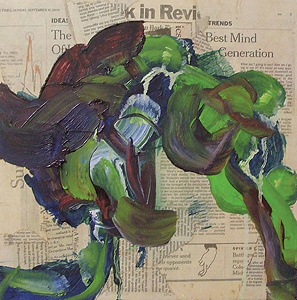 His News Abstraction series consists of newspaper collages painted over with oil abstractions. 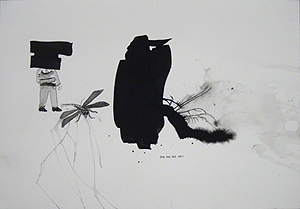 In these works, he juxtaposes two forms of communication: one, of the logical, and the other, the visceral. Daniel Maidman was raised in Toronto, Jerusalem, Chicago, and Washington, D.C. He attended Claude Watson School for the Arts in Toronto, Canada and completed an undergraduate degree at UNC-Chapel Hill. He lived in Los Angeles for eight years, during which time he pursued life drawing and anatomical dissection studies. Drawings from his anatomical atlas are in use in the U.S. Army’s forensics field manual. He has been painting figurative oils for several years now. 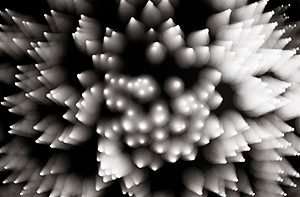 Robert Christian Malmberg specailizes in Alternative and Antique Photography Processes/Mixed Media. 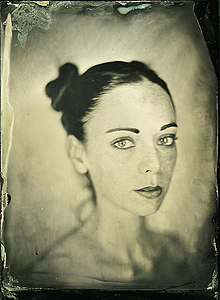 His studio specializes in “wet plate collodion” portraits. This civil war era process uses an exotic blend of chemistry in conjunction with antique photo equipment to produce contemporary yet antiquated images... A California native now residing in Brooklyn, Robert focuses his passion on fashion photography, portraiture and studio art. Arthur May’s work is comprised of small, abstract, carefully crafted paintings. The images deal with reality, but at a studied distance. They are involved in formalist issues such as, balance, proportion, and scale. Color is used for it’s emotional impact. Space and spatial resolution are primary criteria. 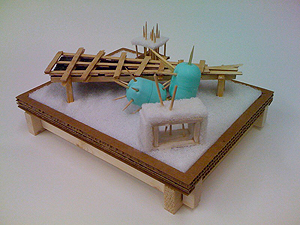 A level of spatial ambiguity is sought, serving to expand perceptual possibilities. The paintings draw primarily from artists who worked in the first half of the twentieth century. The work is executed in oil on canvas or panel, and is primarily small 24”x 24” or 30”x 30”. He creates a group of paintings that can serve to reassert the case for a non-minimal abstract art. Although Arthur May is essentially a self-taught artist, he holds degrees from Rensselaer Polytechnic Institute and the University of Pennsylvania where he studied painting with George Rickey, and Neil Welliver. He is a fellow of the American Academy in Rome where he presented a one-man show of paintings and drawings at the completion of his fellowship. Adrian Meraz received his BFA from Otis College of Art and Design in 2000 and his MFA from Yale University, School of Art, Department of Sculpture in 2005. In 2004, he had a solo exhibit at the Santa Monica Museum of Art, Santa Monica, California and in 2005 at the 4-F Gallery, Los Angeles, California. In 2001, 2003, 2004, 2005, and 2007 he has been in group exhibits in Los Angeles, Santa Monica, and New Haven. 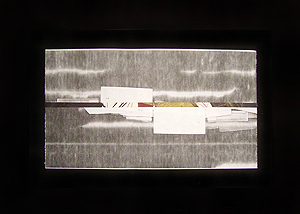 In 1997 and 1998 he was awarded for Works on Paper, The Saul & Sally Fifer Bernstein, Friends of Joe Mugnaini Award. 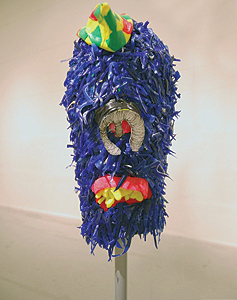 In 2003 he received the California Community Foundation Fellowship. In 2004 he authored the article entitled Contemporaries, Five Years Of Grant Making In The Visual Arts, California Community Foundation, pp. 28-9. Cheryl Molnar received a BFA in graphic design from Rhode Island School of Design and an MFA in painting from Pratt Institute. 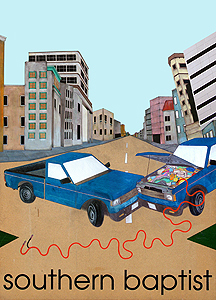 Cheryl’s collage and installation work has been exhibited at McCaig-Welles Rosenthal Galleries in Brooklyn and San Francisco, Platform Gallery in Chelsea, Lower Manhattan Cultural Council and is currently in a group show titled, This Modern World, at the General Electric Corporate Headquarters in Conn.
Nori Pao lives and works in Brooklyn. For this event, she will be showing part of an ongoing drawing project and recent photographs. Lives and works on Earth. He will be showing a test episode of The “TV SHOW”. Born and raised in the “‘burbs of Chicago”, Julie Solomon from an early age was labeled “the artist” of the group. Her creative sensibilities are a colorful combination of cerebral logic, and soulful whimsy. Inspired and mostly self-taught by Life’s many adventures, Julie’s work reflects her love of collected objects and materials. Recent projects include restaurant design, furniture, mixed media, collage, graphic design and sewing. For her, the passion is not in being ‘the artist’, but lies in the simple desire to create. Julie now lives, works and creates in Brooklyn, NY. Vinyl, Vinyl, Vinyl. 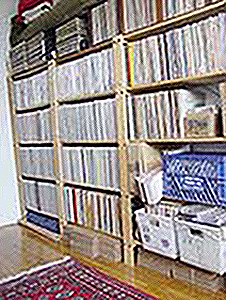 The world of records: 33 rpm LPs, 12”, 7”, 45rpm, along with CDs, cassette tapes, DVDs, and laserdiscs, brought to you by eccentric musician and computer artists, Scott Prato and Bonnie Kane. Used, new, reissued, still sealed: Jazz, Rock, Blues, Psych, Prog, Avant-Garde, World, and more. Dig the music, revel in the cover art! 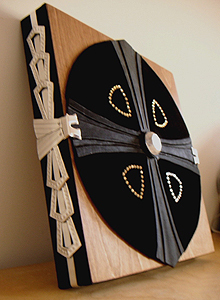 Kim Carr Valdez developed a decorative aesthetic to explore relationships between decorative art, manufacturing, consumer appeal, and hand crafted objects. Her small detailed sculptures may be temporary and are often reconfigured, a collection of parts physically held together by tension. Valdez has an intensive studio practice hand crafting metal components altering & deconstructing commercially available parts, decorative accents, household hardware, jewelry findings and sewing accessories. Each work is part of the artist’s continuing social narrative, recontextualizing each part into a new truth or story often implying a tenuous functionality. Kim Carr Valdez was born in 1974 and raised in Gilbertsville, NY. She currently lives and works in Brooklyn, NY. She received a BA in Studio Art from Hartwick College and an MFA in Sculpture from Syracuse University. Valdez has been a resident artist at Sculpture Space, Utica, NY and her work has been featured in exhibitions at the Everson Museum in Syracuse, NY, The Soho 20 Gallery in Chelsea, and most recently at Johns Hopkins University. Paul Valdez was raised in Phoenix AZ. He initially studied Welding Technologies and Metalsmithing at Yavapai Community College in Prescott, AZ and was employed for several years as a welder and fabricator for the aerospace and microchip industries. He later returned to school and received his BFA in Metalsmithing from Syracuse University in 2004. He later studied metals at RIT’s School for American Craftsman. He now lives and works in Brooklyn, NY. 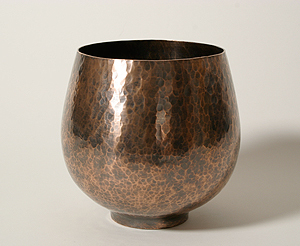 Currently he is working on a series of vessels that are both decorative and sculptural using both traditional silversmithing techniques and modern manufacturing tools.